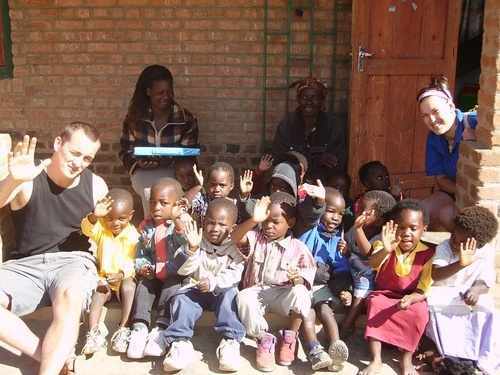 Michelle found teaching in Malawi so rewarding that in 2004 and 2005 she returned with friends in order to donate educational resources to Mlanda Pre School, Mlanda Primary School and Mlanda Secondary School. 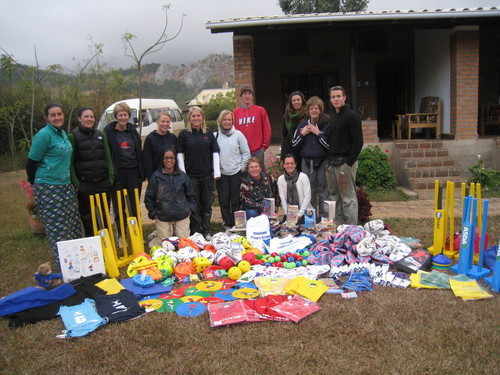 Resources included reading books, sports equipment, Science Equipment, pens, pencils, paints and games. In 2006 Michelle led a team of volunteer students from De Montfort University, Bedford (now the Uuniversity of Bedfordshire). 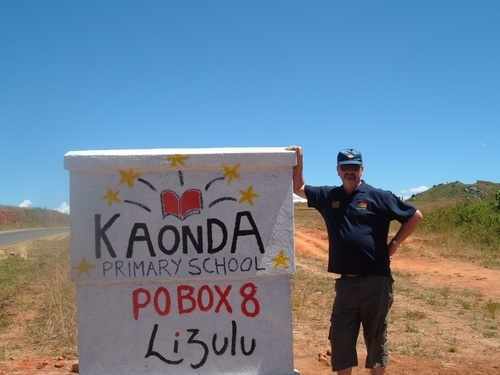 £16,000 was raised to repair and refurbish Lizulu Primary School. One of the most inventive fundraising initiatives was a Naked Calendar involving the University's sports teams an even some of the lecturers! 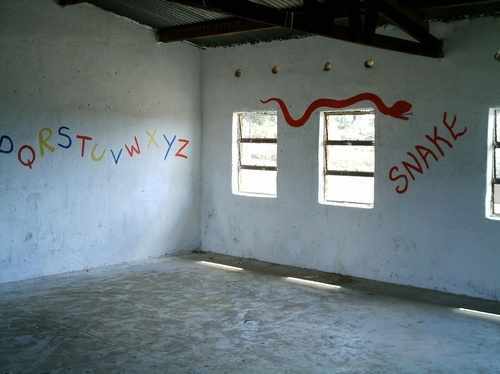 Money was used to hire local builders and carpenters to repair the walls and floors and doors of Lizulu Primary's 12 classrooms. 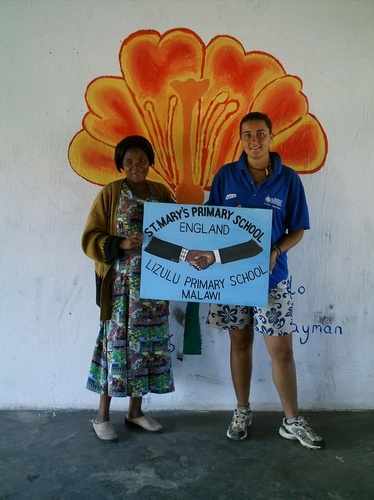 50 new desks were made by the local carpenter and over £500 of sports equipment was donated to the School. 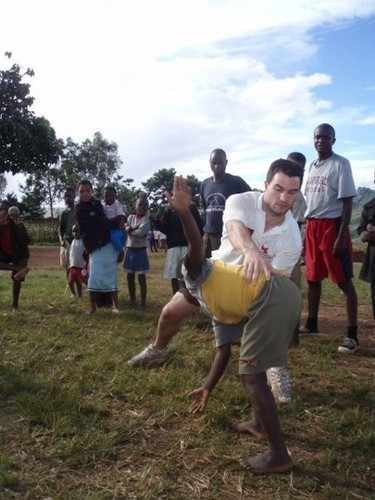 The volunteers also took time to teach cricket and netball to willing participants! 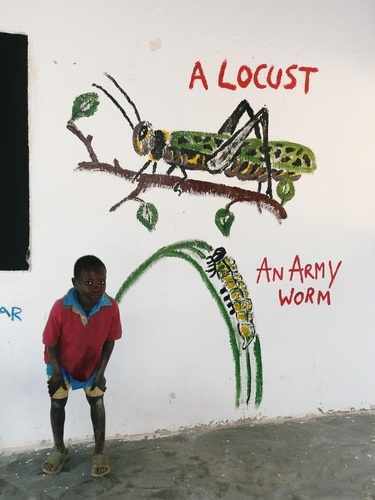 £8,000 of the money raised in 2006 was used to provide neighbouring Lizulu Secondary School with a new Science Laboratory, making it only the third school of forty in the district to have such a facitlity. Later in 2007 £3,000 of money raised during the course of that year was used to fit the laboratory with concrete work surfaces, sinks, gas taps and electricity. 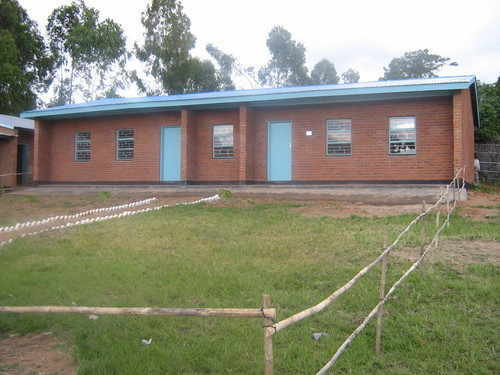 Lizulu CDSS has a dormitory for students wishing to remain on site for study in the evenings. 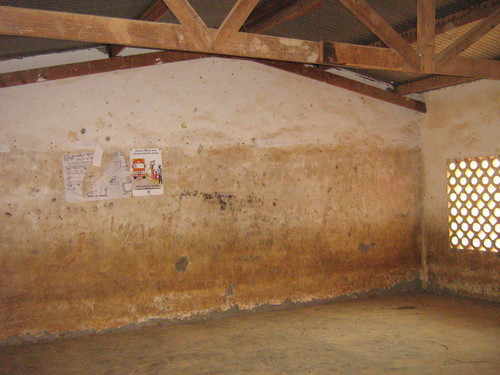 The dormitory was in a particularly sorry state with no beds, cooking or washing facilities. 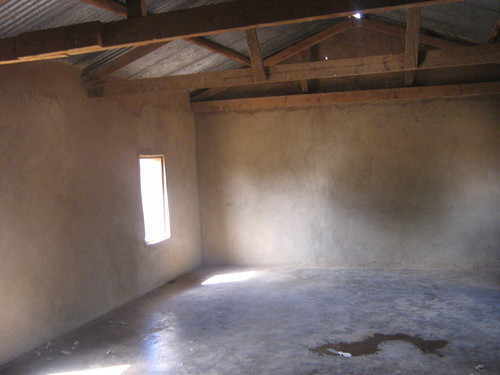 The dormitory itself has a concrete floor but the walls and roof are made of iron sheets. This makes the dormitory extreemly cold in the winter and far too hot during the summer months. With money raised in 2006 we were able to provided the dormitory with 50 wooden beds, made locally in Ntcheu, mattresses and blankets. 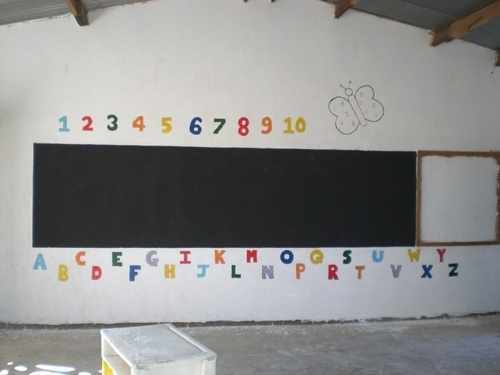 In 2007 while teaching at the Bishop’s Stortford College in Hertfordshire Michelle co-ordinated a project to repair and refurbish Masasa Primary School. Masasa Primary School was in a terrible condition with the library, school hall and all 11 classrooms in a severe state of disrepair. Plaster was falling off the walls and large holes has appeared in the brickwork, floors and around the doors and windows. 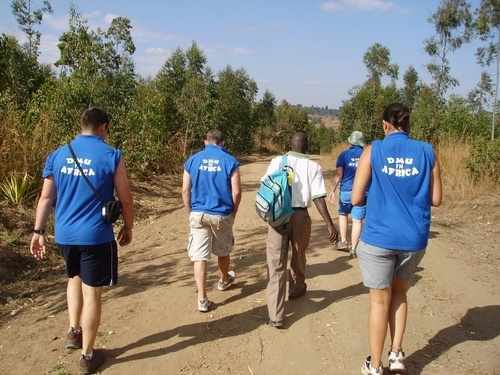 In the summer of 2007 I led a team of twelve Sixth Form students and two staff out to Malawi. 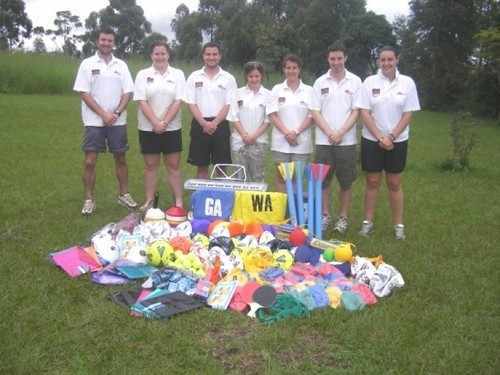 During the course of 2007/2008 £18,000 was raised by exciting events such as; a sponsored swim, Year 4 and 5 sleep over at school, fun day, jewellery stall and donations from small local businesses. 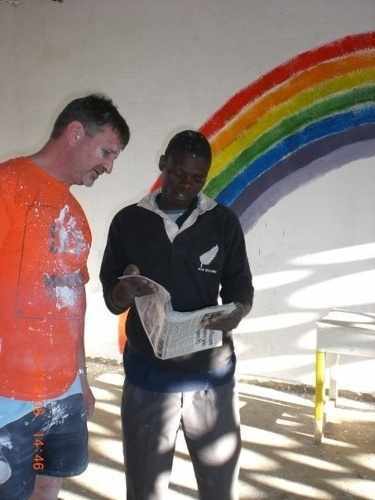 The team spent a week working at Masasa Primary school together with local builders and carpenters, lime washing and then decorating the walls with coloured paints. Masasa Primary School was given a mountain of sports equipment and reading books, as were Lizulu Primary and Secondary School once again. 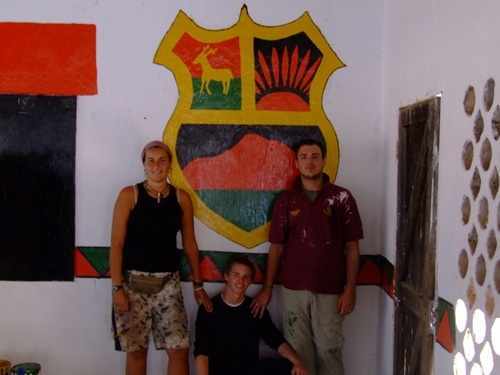 In April 2008 Michelle led a team of ten volunteers to Malawi once again to assist in repairing and redecorating Kaonda Primary School. We raised £6,000 and were able to completely refurbish four classrooms, provide sixty new desks, educational resources, equipment for sport , new road sign and a new Staff Room! Local builders were employed to construct the Staff Room, which also now houses the Head Teachers office and a much needed store room. 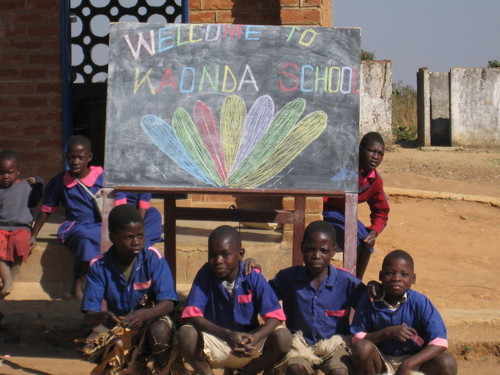 Later in 2008 Glendower Prep School donated a further £350 to Kaonda Primary School which was used to build a book case before it was filled with new text books! 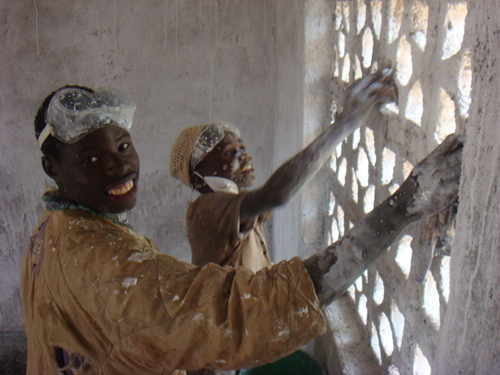 In July 2008 Michelle led a second team of 12 volunteers to repair and redecorate Chilobwe Primary School, another school in Ntcheu District and the most challenging project to date. All members of the team worked hard to raise funds for the project (totalling £11,000). 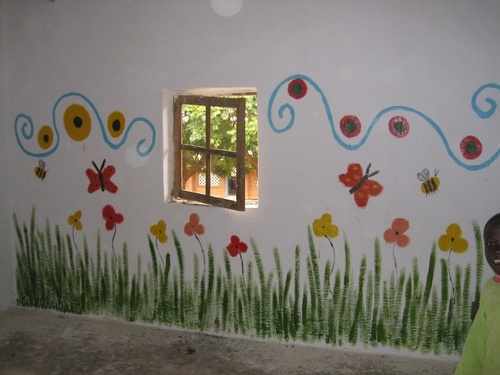 Every room needed both walls and floors repairing with one classroom needing a new wall entirely! 16 rooms were repaired and redecorated and it was a real highlight to design a new emblem for the School. The £11,000 also provided 6 new pit latrine toilets, 80 new desks, sports equipment and mountains of new pens, work books and reading books. 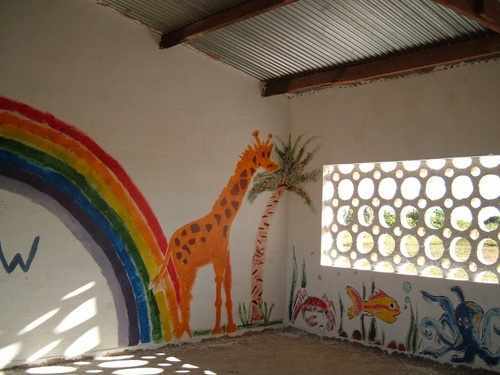 In July 2009 Msana Wan'gombe Pre-School in the village of Chipigera was our project. 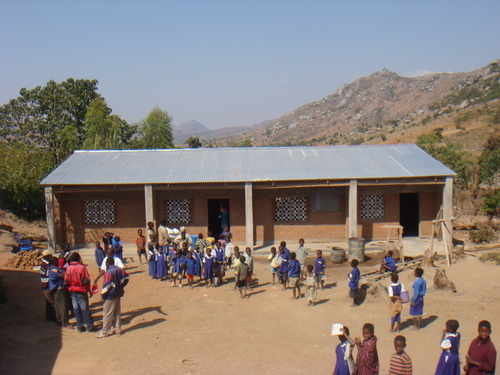 We raised over £10,000 for the project and were able to build a totally new school. 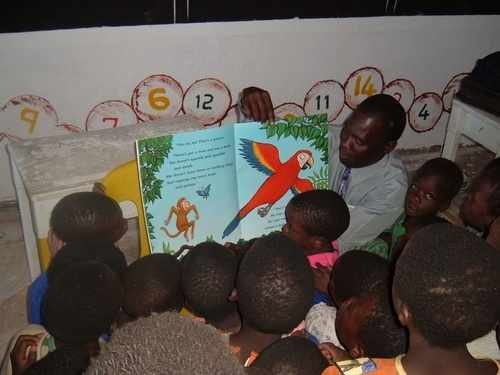 The pupils at Msana Wan’gombe Pre School were learning under a thatched building, but now have two brick classrooms, complete with beautifully painted walls and a mountain of new books, pens and sports equipment. We always have the most wonderful ceremonies to celebrate any work/ construction at the schools and always take time to visit the Church at Mlanda. 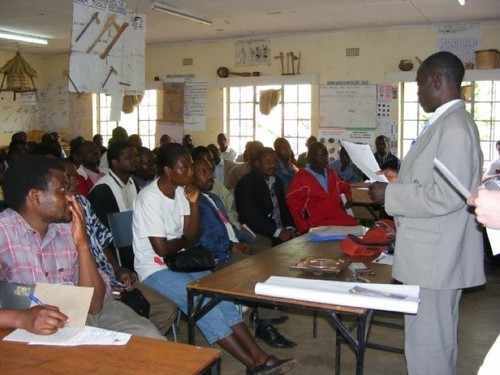 When we first visited Khombwe in April 2009, up in the rolling hills of Lizulu Zone there were three classes (Standards 1,2 and 3) with the school set to expand to standard 4 by 2011. 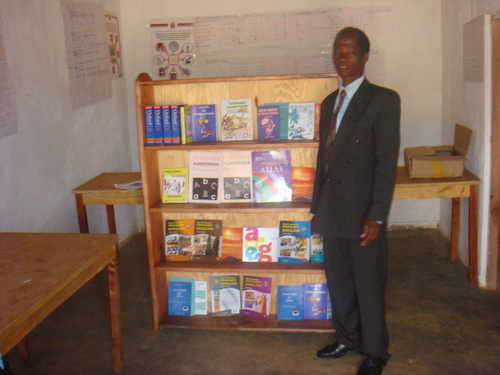 The School had a wonderful Headteacher, Mr Liwonde, and two other trained teachers. 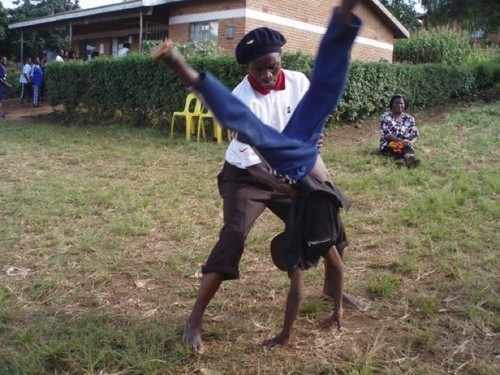 However, Khombwe Primary School had no school building! 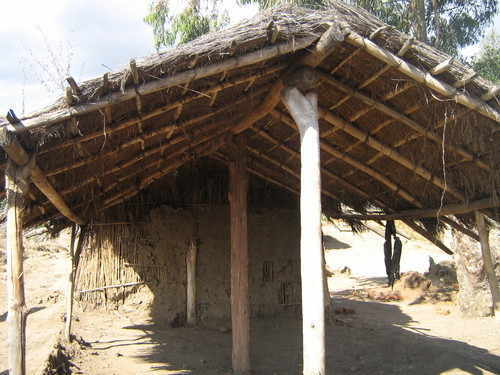 One class was taught under a tree, another under a thatched make-shift shelter, with the final class taught in the village church. 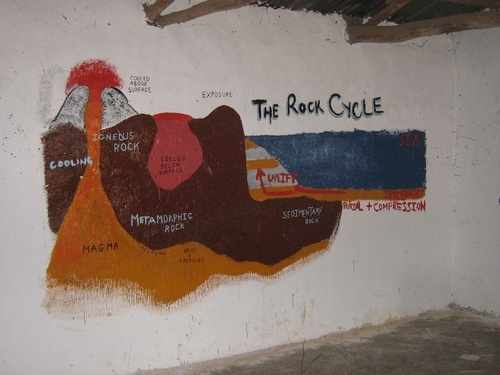 This left the teachers with nowhere to store their little resources and only the church to teach all 3 classes in when the rains came. So desperate was the community here for a school building that they had already started to mould bricks when we first went to visit the school. Their hope was that we, at Inspire Malawi, would see their desire and would be able to support the construction of a new school. Khombwe Primary School desperately needed four classrooms, toilets and both teaching and learning resources and we are delighted to report that in August 2010 we completed our biggest project to date by providing Khombwe Primary School with four new classrooms, six new toilets and a mountain of educational resources. We were delighted this year to receive support from the AV Foundation who sourced funding from the Charterhouse Charitable Trust. 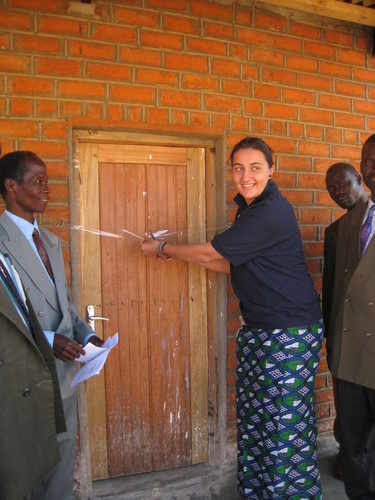 Staff, pupils and their families at Queen Anne’s School in Caversham were also heavily involved in the fundraising for Khombwe, and on 19th August sent a team of eleven Sixth Form students and staff to Malawi in order to paint, decorate and officially open this new school. The team from QAS were, in fact, so wonderfully dynamic, fun and hard working that we were able to paint a fifth room next to the school that is to be used as a nursery! 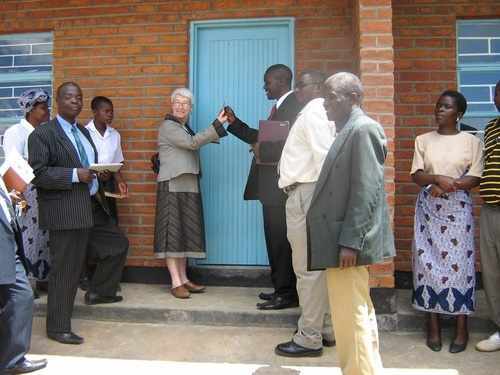 The Opening Ceremony on Monday 30th August 2010 was spectacular and we were honoured to welcome Mr Nkhata, District Education Manager (DEM) for Ntcheu District to preside over the ceremony and officially open the new school. It is his hope that the Ministry for Education will now compliment the work of Inspire Malawi by providing these new classrooms with chairs. We were all very moved by the wonderful singing and dancing performed in celebration of the development and enjoyed a lovely lunch provided by the community. 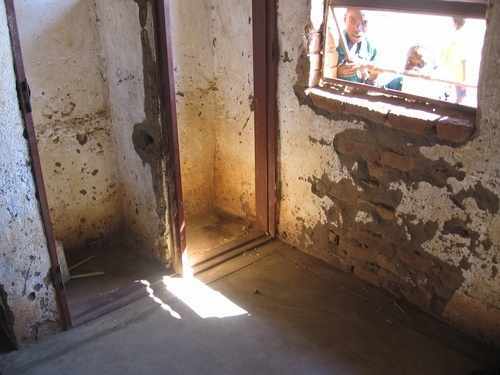 In April 2011 Michelle Rowe revisited Khombwe Primary School to monitor the School’s condition. 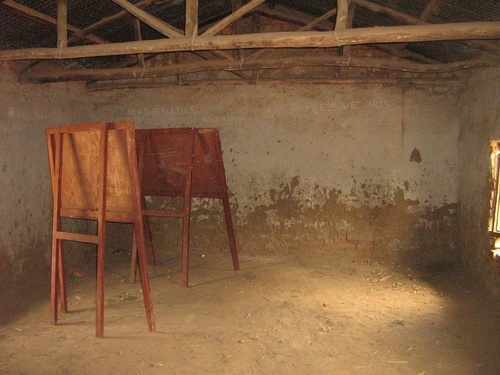 Classrooms were locked and cared for. Since August 2011, under the guidance of Head Master Mr Liwonde, a beautiful garden had been created in front of the top two classrooms and a flag pole erected. A play area has been flattened out close to the second block and there was also a netball court. 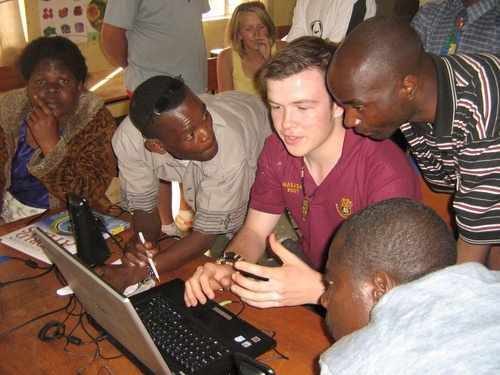 If Staff and pupils continue to care for their new School it is our hope to support Khombwe School again later this year in providing new desks. 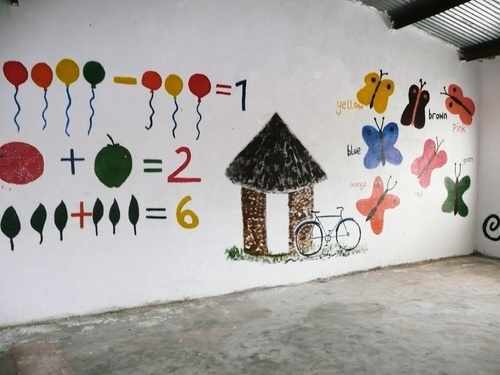 Our development project at this School will benefit hundreds of children for many years to come. 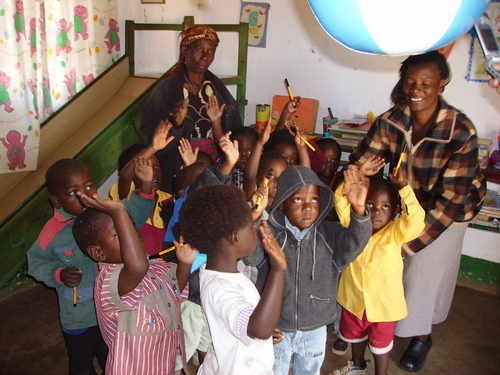 Khombwe Primary School is now safe and inspiring learning environment. Congratulations and THANK YOU to the AV Foundation and Charter House Charitable Trust for all your support of our development project at Khombwe School. 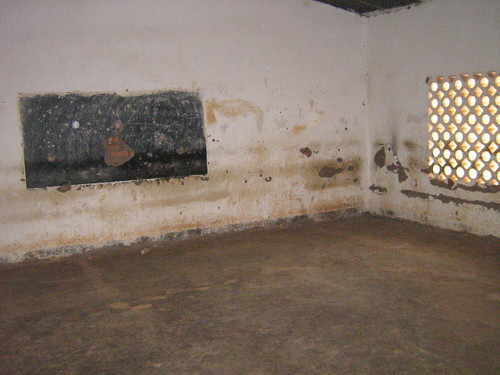 We first visited this school in 2008 and were shocked at the the extremely poor learning and sanitary conditions. 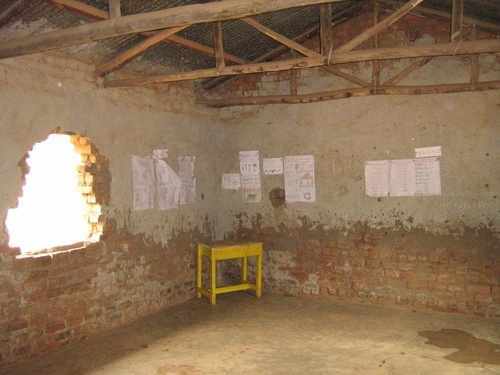 There were four classrooms, previously Government Tax Offices, which were too small for purpose and in a severe state of disrepair. 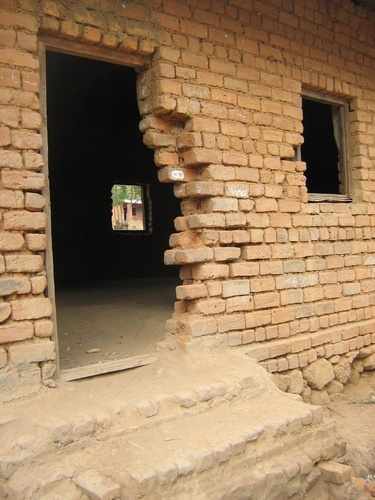 Cracks were so large in the brickwork that daylight could be seen and the roof leaked so badly in the rainy season that classes had to be cancelled! 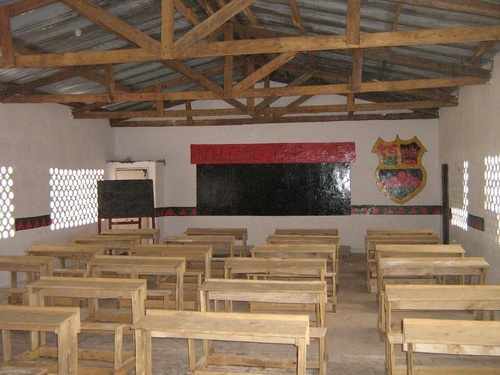 In February 2012 work began in the village building two new classrooms. The community pulled together to support the project by moulding bricks and collecting river sand to be used when mixing cement. 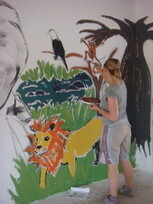 By July 2012 the classrooms were complete and, together with four volunteers from UK, including directors Jess and Michelle, the team spent a week painting and decorating the new classrooms. 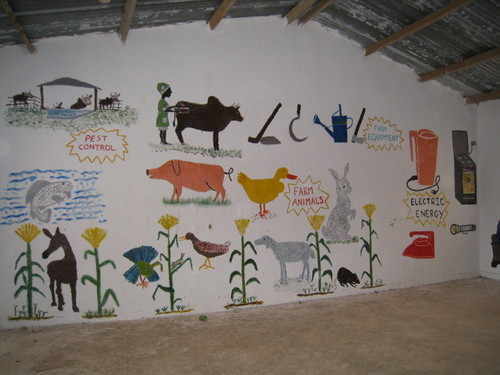 Walls were brought to life with vivid colours, images and diagrams. A wonderful opening ceremony took place at which the school was officially handed over to the village. 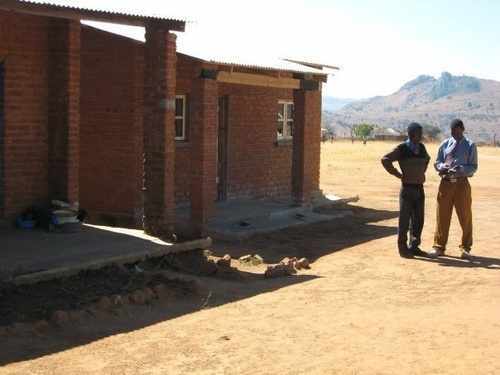 It was attended by local Chiefs, Village Headman and the local MP who handed over a cheque from the government and pledged a second building, provided by government to match our own! Excellent news! 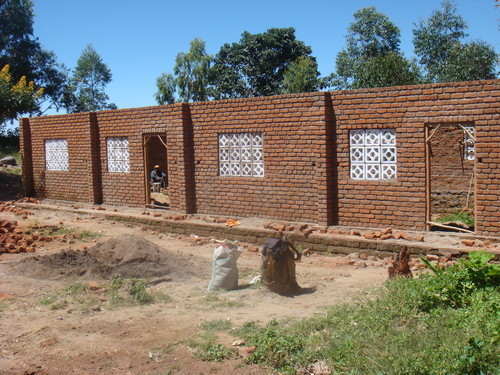 The end of 2013 and first few months of 2014 saw further development work at Namcholi school with Inspire Malawi providing a second double block classroom, a staffroom and a store room! 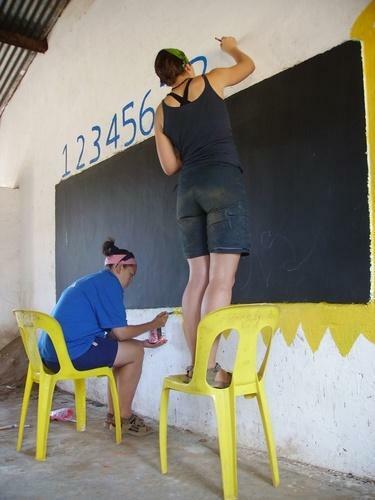 In April 2014 a small team flew with Michelle to paint these new rooms and hand the new block over to the Community. It looks like a completely new school now, with six brand new classrooms, staffroom and storeroom and is a great source of pride for the community here. 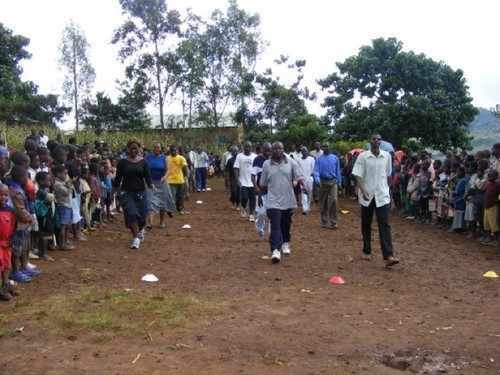 We also provided the school with six new toilets and further sports equipment and writing materials. 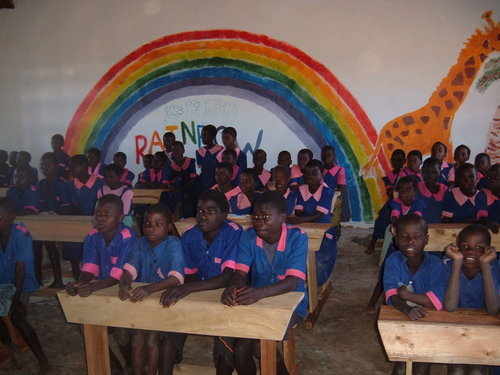 Mlanda Primary School is a large school right in the heart of Mlanda Village. It has two form entry from Standard one to seven and a single standard eight class. 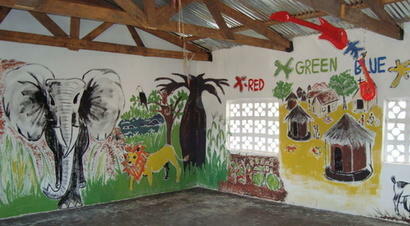 Approximately 1,500 children attend this school; over crowing is a huge issue. 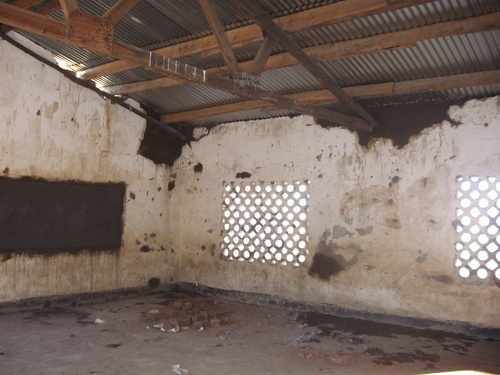 There are 16 classrooms, a Library and an Administration block, and were all in a state of severe disrepair. Plaster was falling from the walls, there was water damage to the floors and all classrooms had no closing windows or locking doors. This led to vandalism, theft and grafetti within the classrooms. In 2010 there were only thirty desks in the whole school and so pupils were forced to sit on the floor when learning. Some of the buildings are almost 100 years old and were becoming unsafe, with bowed walls and damaged roofing. The first stage of our project was begun in summer 2011, when several of the classes in worst condition underwent full restoration works. We took a wall out in two blocks and rebuilt it with buttresses for extra support. 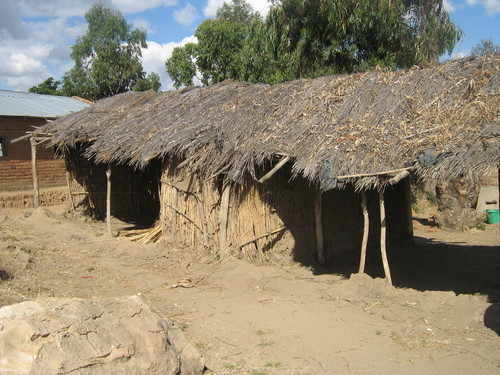 One block had a new corrugated iron roof and all windows and doors were replaced. 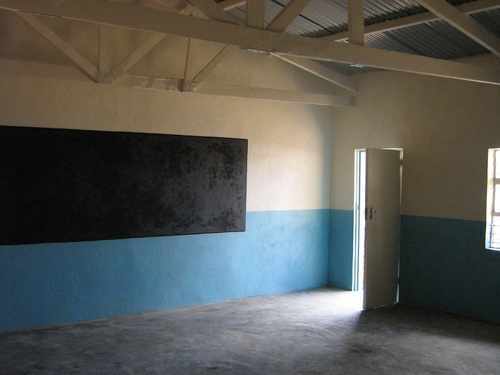 Each of the seven rooms was replastered, with new blackboards and floors. 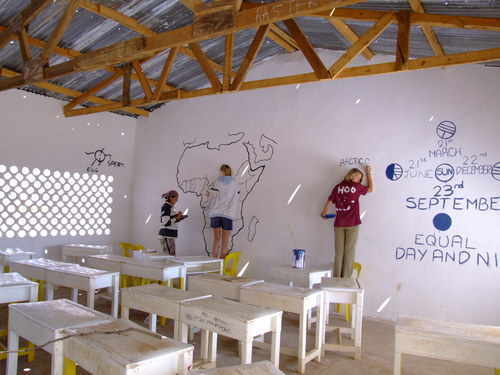 In April 2012 a team of sixteen volunteers from Bishop's Stortford College flew out and spent a week painting and decorationg classrooms. 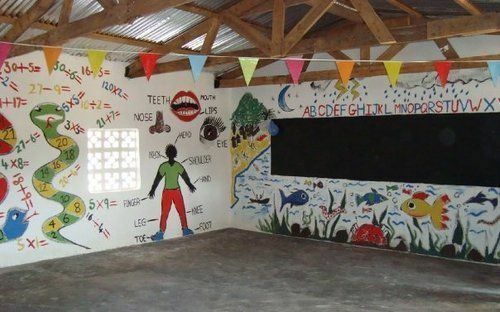 Money was spent liming classroom walls to a brilliant white and then the walls were brought to life with colourful images as teaching tools. 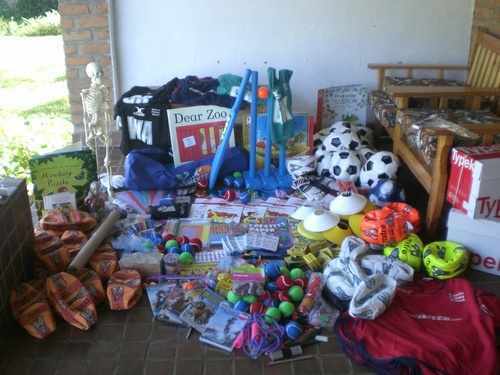 We also were able to provide the school with a mountain of sports equipment and books for their library. 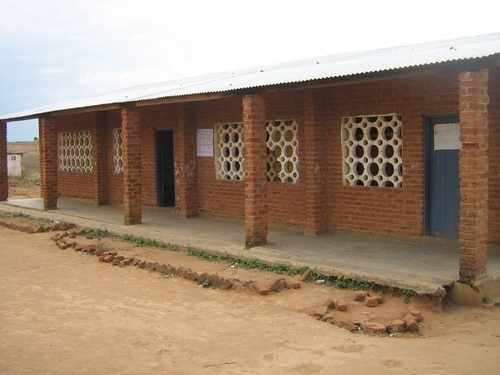 All blocks were repointed and painted externally to protect them from the extreme weather in Malawi, with storm drains surrounding all classrooms. 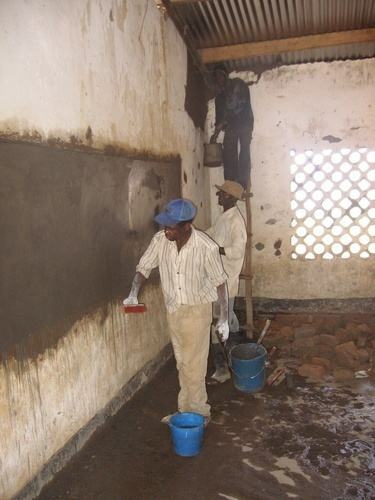 The second phase of work began in Summer 2013 to repair a further five classrooms. Again, all rooms were re-plastered, re-floored and repainted. Work was completed on the classrooms externally (all were repointed and storm drains built) and windows were moved to be facing the staffroom (to lessen vandalism as here they are more visable). 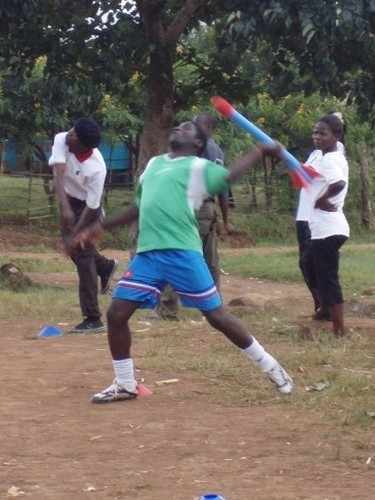 We had enough funding available to build six new pit latrine toilets on site and provide further equipment for sport and books for the library. 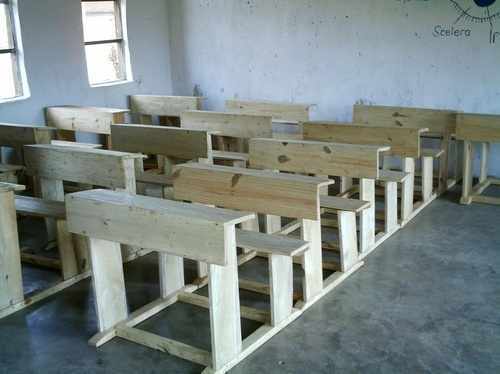 We build sixty new desks and donated twenty of these to neighbouring schools; Namcholi Ptrimary and Khombe Primary School. 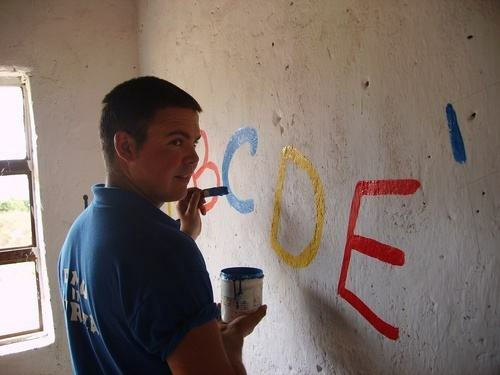 In April 2014 a team of eighteen Sixth Form students from Bishop's Stortford College in Hertfordshire flew to Malawi and spent a week painting and decorating these new rooms, doors and windows. There was an enormous celebration, on both occasions, which saw the children and members of the community singing traditional songs, and dancing Ngoni Tribe ceremonial dances. Local chiefs from far and wide attended this event together with the Reverend and head teachers from neighbouring schools. 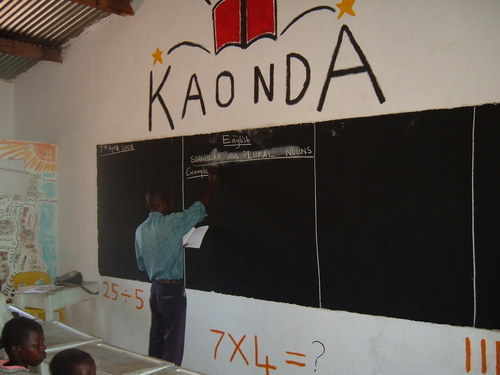 In total, more than £25,000 has been spent on improving facilities at Mlanda Primary and we have plans to continue with our restoration work in 2016 in partnership with bishop’s Stortford College. Two teaching blocks, the Administration Block and the Library are still in need of a 'makeover' and the school is still desperately in need of further desks, chairs and toilets. Feeling inspired? . . then join our army of supporters and contact us!